The European Union’s (EU) General Data Protection Regulation (GDPR) goes into effect May 25, 2018, and newsflash: it’s a big deal. This regulation is expected change the data privacy landscape, not only in the EU, but across the globe. The GDPR was written to ensure the privacy of EU citizens’ personal data, regardless of where that data is controlled or processed. What does that mean for you? Even if you’re not operating a business in the EU, this law may still apply to you. If you have or could acquire customers, employees, etc. who are EU citizens, listen up. It is also very possible that the GDPR will set the precedent for data privacy regulations to follow, so why not be proactive? Not only does the GDPR have an “extra-territorial reach,” meaning that it can be enforced outside of the EU, but it has also strengthened the rights of the “data subject,” i.e. individual. Make sure to pay close attention to these rights, including the individual’s right to know who is accessing their data, why, and for how long. The GDPR also strengthens the conditions for consent, while extending the right of the individual to withdraw consent at any time, for any reason. The GDPR outlines the specific roles of the “data controller” vs the “data processor,” along with new requirements for breach notification. Know your role, as well as the role of the companies you do business with. Understanding the GDPR is step one. Regarding compliance, it’s also important to understand where your TMC comes in. For example, what personal data do TMCs typically process? You need to know what to look for to ensure that your TMC is adequately protecting your travelers’ data. Data is the most at risk when in transit, and we’d be remiss if we didn’t mention the easy-to-implement strategies that can reduce risk to your traveler’s data while they’re on the road. Learn simple tips for protecting your data, and share them with your travelers. 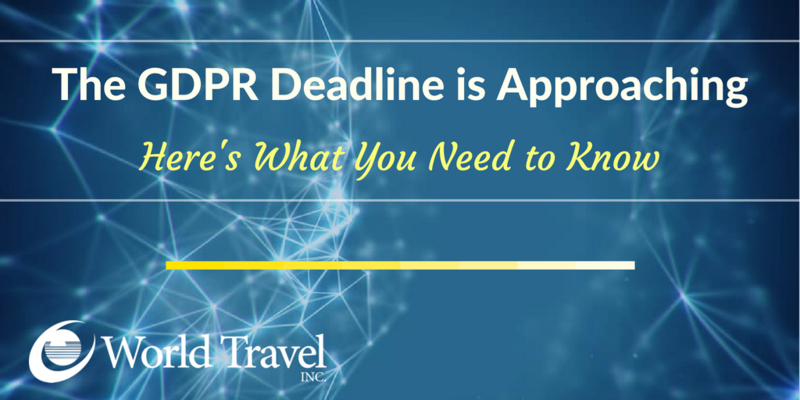 Regardless of whether you are a client of World Travel, Inc., we think you ought to know what we do, and here’s why: you can use this information as you evaluate your overall data security program or that of your current TMC. It never hurts to know what others are doing, and this information may inspire you to implement new security procedures and best practices that better protect your travelers’ data. We’ve developed a whitepaper on each of the topics listed above, and we’re sharing them all for FREE. Download the 4-part series, “Data Security Considerations for Your Corporate Travel Program,” to learn more! Have a specific question about the GDPR? Contact us at sales@worldtravelinc.com.